Breakfast at 8:30am, Linda, Janel and I join Lek and Nang at the table. My morning ritual lime juice is excellent, following by 2 fried eggs (with very golden yolks) and bacon. We’re readying our bikes by 9:15am or so – the schedule is pretty relaxed. The plan is to avoid the van today in entirety if possible, and Linda makes it her goal to try it. Janel, still on antibiotics, decides to invest further in her flu recovery and avoids the bike today. Gunther and I take off right away. Gunther has shown yesterday that he wants to keep up a healthy pace, and since Lek and James are staying with the girls, I decide to pace with Gunter as long as I can. We pedal eastward on 401 over a stretch of sustained rolling hills, about 20 km or so, finally stopping at a shady clearing. 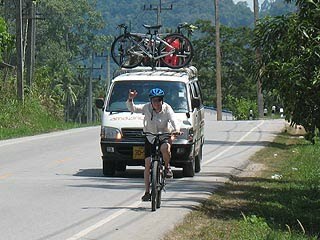 The scenery is stunning southern Thailand: limestone mountains jutting skyward from the rolling hills covered in foliage, orchards of banana trees, orchards of palm trees, orchards of rubber trees. The girls join us in about 25 minutes. The ride has been quite warm and humid, and Linda’s face is getting pretty red. Still, she is fit and I’m proud she’s made it in good shape. 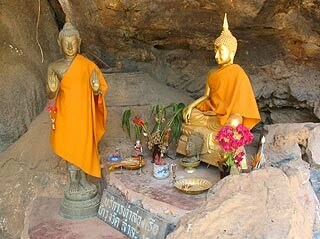 Our stop is located at a cave considered as a religious site by Buddhists. 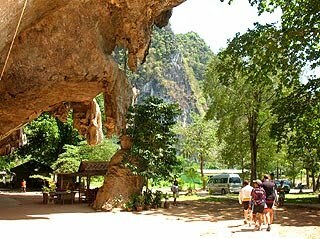 On the other side of the cave is a large creek that is loaded with fish. James has purchased fish food from vendors (which smells curiously like seaweed and fish). When we start tossing it, the fish appear so thick you could even walk over them. James laughs and suggests I try it. 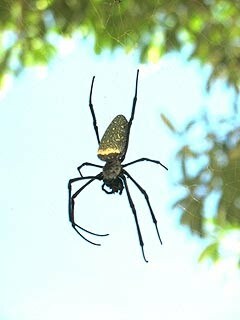 As we prepare for more riding, I spotted a big spider hanging in on a web spanning two trees. Did I say big? This guy is about the size of a softball across. He must catch small birds for a living. Gunther and I took off from the group again. After the stop, Gunther is raring to go, and he really starts to motor. I keep up, though, and when we start hitting the rolling hills, I’m zooming past him on all the inclines. We keep a nice pace together on average – with him speeding past me on the downhills. The gorgeous views keep rolling by. After another 27km or so, I’m just about to pass out. The day has gotten hotter and steamier, and I’m actually getting dizzy from dehydration. I’d been rationing my one water bottle for many kilometers now, and finally I’m at the break point. “Water stop,” I call out and we find the shade of a big tree. Gunther is less affected because he is carrying 3.5 liters in a Camelbak. After I gain my wits and down the last of my water, we roll a few more meters up the street and find a tiny store that sells me a cold bottle. Sweetness! 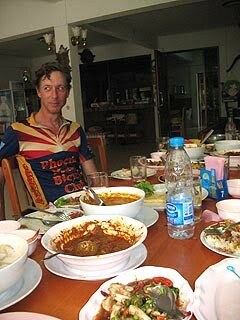 We ride only a few more km and roll into a town, I believe it is called Ban Ta Khun. Decidedly not a tourist site, we are especially oddballs in our cycling clothes. It is a typical Thai town with sidewalks full of shops and food stalls. We find some shade on a step and Gunther tells me much about his career as a scuba diving instructor in Italy and then as a tourism manager in United Arab Emirates. While we spoke, I was thinking to myself, if Linda comes rolling up on her bike, and not in the van, I’m really going to be impressed. James, Lek, Vicky, and (drumroll) … Linda! They pedal into town and stop for us. I am really impressed that she’s made it. She says she drank about 7 bottles of water on the way. By the way, the temperature on record for this date was 38C (100F) and up to 94% RH. James says that our restaurant is just around the corner, about 5 minutes. We take off and the 5 minutes turns into about 15, another 2 or 3 km further. We’re all ready to get out of the sun. James has found an unassuming place you’d probably never find on your own. Hardly looks like a restaurant until we go inside and find tables. Cold water and then food starts coming out and it’s really delicious: curries and soups and stir-fried prawns and vegetables and potatoes. Lots of steamed rice. As we eat, the plates keep coming out, and with each one we are raising our eyebrows – more food? Pretty soon, James is getting concerned as the table fills up with plates to the overflow point. It turns out that our 8 dishes have mistakenly been prepared as 16 – we have twice as much food as intended! Tastes great after our ride! C’mon- there can’t be more? Stuffed, we mill about the place, digesting. Janel and I examine some very unusual scaly hides mounted on the restaurant walls. She postulates that they might be echindas, but she later looks it up and finds out they are pangolins. I’ve never heard of them before – a small large-scaled anteater that lives around here (and is routinely eaten). 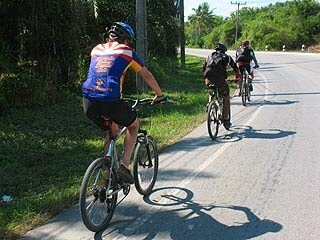 The final optional leg of the ride is about 12 km and climbs several hills on the way out of town. Vicky and Linda decide to cool off in the van on the way, and they get a few photos of the guys on the road. 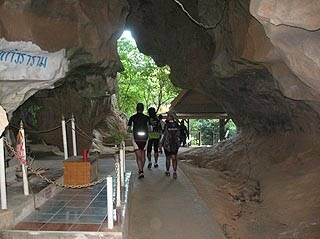 The road indeed does a few moderate climbs, but through some gorgeous tropical scenery. Riders and van stop at a small convenience store and go in for provisions (beer and ice). We make our selections, and then are entertained by a very prolonged discussion with the clerk in Thai about how the bill should be separated. There is adorable tiny dog there and the girls go nuts for him (Tolek). 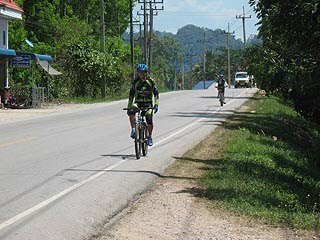 A couple more climbs, one of them steep, and we reach Ratchaprapha Dam and the Chiao Lan Reservoir. We’re immediately struck 1st by the slightly cooler breezes coming off the water, and then by the gorgeous shade of turquoise blue. Final mileage for the day was around 65km, or around 40 miles. But what great miles – you couldn’t ask for a better way to see this part of the country. May be the sweatiest ride we’ve ever done. We load up bags, gear, and bikes onto a long boat. We won’t need the bikes, but there is no secure way to store them on the van in the parking lot. 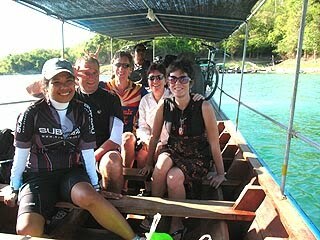 Then a real treat – a 35 minute ride on the glass-smooth lake, complete with wonderfully cooling breezes. 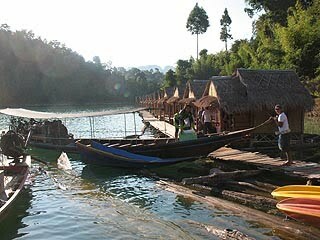 The gorgeous color of the lake disappears into ancient Thai forests of great variety. 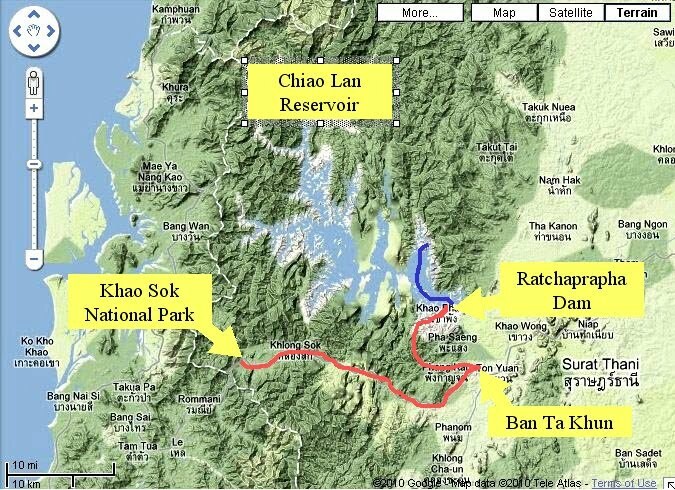 We learn that the Chiao Lan Reservoir is manmade – the Ratchaprapha Dam was built in 1982 at the Khlong Saeng River and flooded thousands of hectares. 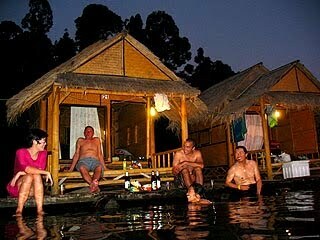 We finally approach our accommodations for the night – a row of tiny huts built on floating bamboo rafts! The huts are truly simple and great. About 8′ square, with a single 6′ mat about 2″ thick in one corner, with pillows, cover sheet and blanket. Group bathroom 50 yards up the hill (across many steps with missing pieces of wood). Mostly Thais are here, and one tour group. It feels like only those really in-the-know would come to this simple idyllic place. James lets us know that we can take out our long boat for a cruise of the lake at sunset, but since it’s already 5pm, we all elect to simply get settled in our rooms, pop on swim suits, and dip into the warm water, which feels somewhere around 88F. At one point I challenge everyone that I can jump off the dock with a glass of beer and still have it to drink when I surface. James warns that the fresh water doesn’t provide much buoyance. I make the jump fine and I can feel the glass still above water the whole time. But only a half glass of beer left! Linda tells me that half flew out on my initial jump, but it brings claps and laughs. Linda brings out some shampoo and we take turns lather each other’s heads, trying to stay afloat. Other visitors are doing the same, and in tranquil evening waters, there seems to emerge a very comfortable cameraderie with all on the lake. Among the conversation, a comment is made that the community bathrooms have no paper. They have only a flexible tube with a dishwater nozzle on the its end plumbed somewhere behind the toilet tank, used to hose down one’s bottom. Gunter comments that he used paper for a few years, but switched to water, which is much more efficient and ecological. James proposes that he’d like to patent the concept of the “bum gun” worldwide. I state that I’m a 53 year-old paper guy myself. Take the square and fold it in half, then again, then into a triangle, then into a thinner triangle, etc. Tear off about 1/2 inch of the point. Unfold the square. You should now have the origianl square with a hole about 1 inch in diameter in the center. Place your index finger all the way through the hole. Insert finger in bum and complete all maintenance required, using the paper as an apron for the rest of your hand. When finished, use your opposite hand to remove the paper, wiping upward to clean your business finger. Use the remaining 1″ circle of paper to clean under your fingernail. On that note, it’s finally time to start a group dinner. 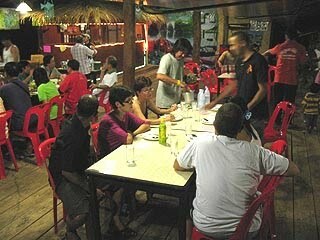 Food is served at a central building and is really quite excellent Thai fare. There is an tour assembly of seemingly disinterested Thai men next to us with a talkative leader who jabbers for at least a half hour. We joke that he almost sounds like an auctioneer. Our food is delicious. Nang especially likes the gouramis, and devours the entire head of one of them, including the eyes. After dinner, we retire to our #21 cabin. Everyone has commented on the prominence of springs in their thin matresses, but ours doesn’t seem to have any. #21 is the lucky cabin. The stars promise to be great here, but the cabin lights are just bright enough to impair the stargazing. James says they’ll go out before midnight and Janel wants to stay up for it. But Linda and I are pretty tired from the day’s activities. We take a final dip in the lake and swim out a ways to find the stargazing improved. Then a 15 minute drip dry on the dock (no towels) and we’re ready to pass out. I awaken numerous times throughout the night, hoping for the lights to be out, but they seem to stay lit the entire night. 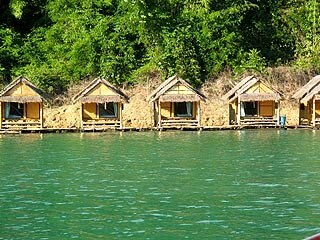 The cabins are very rustic, but comfortable enough. 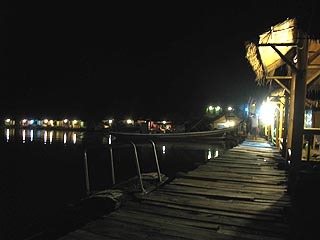 We hear the sounds of other people swimming and walking on the dock all night, but everyone is quiet and respectful, and we sleep pretty well. Ok . . . these last 3 posts are the first time I’ve been GLAD that I wasn’t along for the adventure . . . no towels, no bed, no plumbing??? 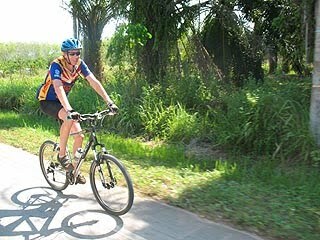 riding bikes in swealtering heat up and down hills and through sand bogs??? what the heck are you guys thinking?? ?